Register for a session with a certified Horse Temperament Typing Consultant. After filling out a questionnaire, the Typing Consultant will review your answers, and ask you questions, through email or phone, about your horse to help you arrive at the correct temperament type for your horse. This kind of session can help clear up any confusion and help you learn more about your horse's temperament type. Get your horse's temperament typed by our professional Horse Temperament Typing Consultants. Please read about our Temperament Consultants and pick the one you would most like to work with. You can then contact them directly at the email provided. They will send you the form and you can begin to understand your horse better. 1. Email the Typing Consultant you are interested in working with to request your Temperament Typing. Master temperament typing consultants have undertaken additional training to address the needs of difficult temperament cases challenged by multiple management and nutritional issues. Certified temperament typing consultants are trained to identify temperament type in horses that do not have significant management or nutritional challenges. A request for two current pictures (head shot and full body shot) of your horse. 3. The Typing Consultant will email you with any followup questions. You can talk with the Typing Consultant by phone** (They will let you know the days and times they are available for phone consultations. The results can be emailed to you and if you have questions you can arrange a call with the Typing Consultant. ** please note the calling with results option is only available to US phone numbers. International results will be sent by email. Kim Bauer is a well-known expert and educator in the field of animal acupressure and massage. Kim began her studies in animal acupressure and Traditional Chinese Medicine in 1999 and is highly regarded here in the U.S. and internationally. She is nationally certified by the National Board of Certification for Animal Acupressure and Massage (NBCAAM) and is an Instructor for the Northwest School of Animal Massage (NWSAM). In January of 2005, Kim created her own business, Animal Ease Therapies, LLC. She works with clients to create individualized plans for each animal that integrates her knowledge of temperament typing, acupressure and massage. 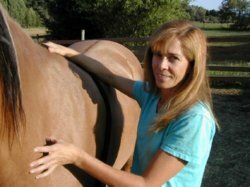 Some of Kim's additional training has included; Equi-taping, Bach flower essences, reiki, homeopathy, Chinese herbs, and equine neurological and muscle disorders. Kim holds a Bachelor of Arts in Philosophy and a Master of Arts in Teaching. She was a middle and elementary school classroom teacher for 14 years before choosing to blend her teaching abilities with her love of animals. Larry Hannon was born and raised on a large cow ranch in the Osage Country of Oklahoma. He attended Oklahoma State University earning a B.S. in Animal Science and a M.S. in Veterinary Parasitology & Microbiology. His emphasis was in the Production/Nutrition Option, and studying the diseases and parasites of livestock. Larry served in the US Air Force as a Veterinary Technician and Field Medic during the Vietnam War,spent six years as a cooperative Extension Agent in Western Nebraska, served on the Nebraska State 4-H Horse Committee, served as ring steward, arena superintendent, and assistant manager of the state horse show and as AKSARBEN Horse Show ring steward, assistant manager, and manager. He has judged numerous 4-H Youth and Open Class horse shows in Nebraska, Colorado, Kansas, Oklahoma and Texas and continues to judge shows, give private lessons and clinics on Harmonious Horsemanship. 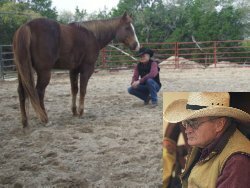 A member of the AQHA as a breeder of ‘Good All Around Using Horses’, Larry is an AQHA Professional Horseman and a member of the American Stock Horse Association, and the Stock Horse of Texas. He continues to start his own colts, and offer them for sale to the public striving to match each horse with the right horse person – be it accomplished rider, novice or youth. It has been said Larry gets inside the heads of both the horse and the rider for positive results and has spent his entire life learning the ways of the horse. Shari started her equestrian journey as an adult amateur, when she moved to the Texas Hill Country. She spent several years searching for the right equine partner and trying to make things work with the wrong horses. Several times she found a good horse, only to find it wasn't a good match for her. During her horse search, she was introduced to the book "Horse Harmony", by Dr. Madalyn Ward. That changed how she looked at horses and gave her a real understanding for why she was struggling with some horses. She used the book to guide her in finding her perfect partner, Finnegan, an Irish Draught gelding with a big heart and a great sense of humor. Together, they are learning dressage and embarking on a fun, new jumping career. Shari quickly discovered she had a true passion for temperament typing and helping owners to better understand their horses, using the Horse Temperament principles. 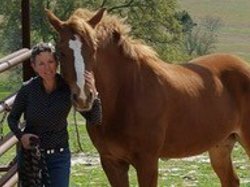 After retiring from a long corporate career, she chose to pursue training as a Horse Temperament Consultant, in order to further her work helping horses and their people build better partnerships. She is also training in holistic equine nutritional studies, through a mentorship with Dr. Ward.